AngAram aRRa aruLALa mAmuni ampadhamE!!! nIL nilaththIr = Oh! The people of this big world!!! The phrases in the thaniyan should be “nIL nilaththIr !!! aruLALa mAmuni ampadhamE nIngAmal enRum thozhumingaL!!!”. This would mean that the author of this thaniyan is calling out the worldly people and asking them to go and prostrate at the lotus feet of aruLALa mAmuni always. The word “enRum” should be added before “nIngAmal” as well as “ninaithu”. So, the phrase “enRum nIngAmal” would mean “without separating or never leaving” and “enRum ninaithu” is “always thinking about”. The word “pramANam” is the trustworth/creditworthy source with which one knows about something. The object or the thing that is known by the pramANam is pramEyam. The essence of pramEyam is pramEyasAram. Here pramANam is nothing else than thirumanthiram. 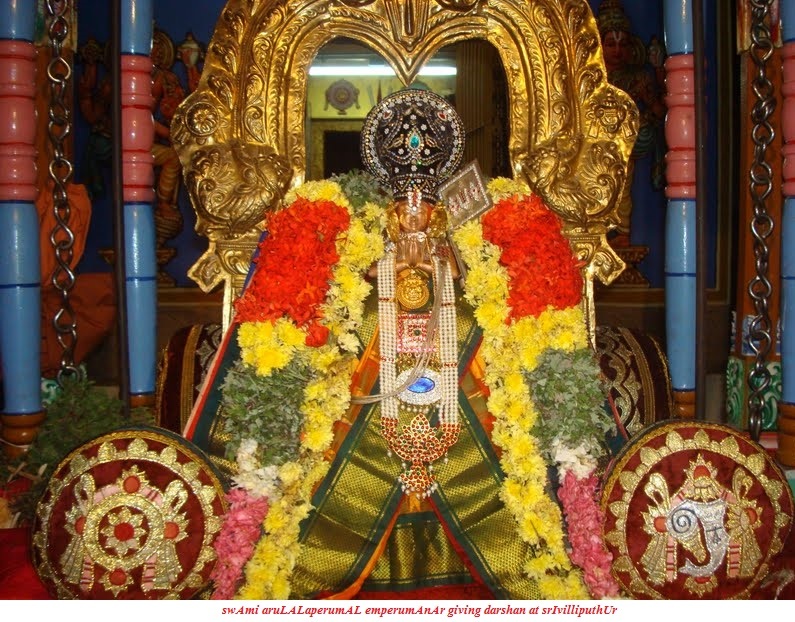 The meaning of thirumanthiram is pramEyam. The essence of this pramEyam is pramEyasAram. “nalla pramEyasAram” is similar to saying “nalla maRai”, that means without any fault or flawless. pAngAga: The grantham (book) pramEya sAram is very easy that those who learn it are being captured by the beauty and its simplicity. The essence of thirumanthiram is being beautifully described in these 10 pAsurams. Hence it is called as pramEya sAram. parindhaLikkum: aruLALa perumAL emberumAnAr blessed the people of this world with this wonderful work called “pramEya sAram”. He blessed all the people of this world in order for them to reach the highest goal. His divine bless was transformed into a book format which is in an easily comprehensible form. 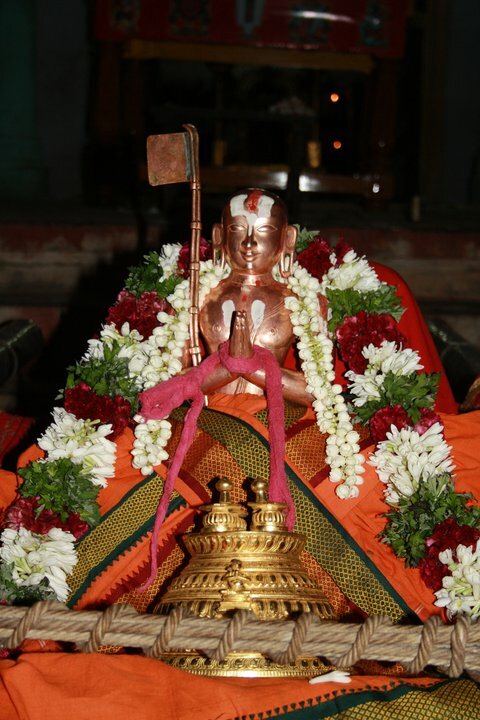 He followed the orders of his AchAryan svAmi rAmAnujAchArya, who asked his disciples to spread the divine purports to all those who are genuinely interested to know. aruLALa mAmuni: “muni” is someone who always thinks about the benevolence of others. This character is something only a muni can have and not any other person. So, he is celebrated here as “mAmuni” or the great muni. One of the many traits of such a mAmuni is that he is completely devoid of any pride in him. The total dearth of any pride in him is being referred as “AngAram aRRa”. The author of this thaniyan urges us to go and prostrate at the lotus feet of such an AchAryan. The person needs to meditate upon this mAmuni’s feet in his mind when prostrating, similar to the relationship between a body and its shadow. In the word “ampadham”, the second degree case ending is being latent. It follows the tholkAppiya grammar that says “aiyum kaNNum allA poruLvayin mei urubu thogA”. ampadhadhai: The prefix “am” means beautiful and “padham” refers to the beautiful feet. The beauty for a feet is the quality of never giving up any disciple at any point of time. The “EkAram” or exclusivity that is the ending syllable as in “ampadhamE” describes the fact that it is enough if we fall at aruLALa mAmuni’s lotus feet, implying that there is no need to go to perumAL. pudhuppuli: the place where svAmi aruLALa mAmuni lived. man: The person who served as the leader of the people who were very well versed in vEdhAs and shAshtrAs. This place “pudhuppuli” is a place that was surrounded by beautiful gardens and fertile orchards. This goes ahead and conveys that this place was a perfect place for those who wanted to have greater knowledge. pudai: This means surrounded on all four sides. Hey! People of this great world!!! Please take refuge at the lotus feet of svAmi aruLALa mAmuni who hailed from the place called pudhuppuli” that is surrounded by beautiful gardens and fertile orchards and the one who gave the world the essence of thirumanthiram in the form of a wonderful book called “pramEya sAram”.